John Kemp at the Guardian is making a case that the US and UK are on the brink of a debt disaster. Let's investigate the discussion and charts. While both governments experiment with quantitative easing, bad banks to absorb non-performing loans, and state guarantees to restart bank lending, the only real way out is some combination of widespread corporate default, debt write-downs and inflation to reduce the burden of debt to more manageable levels. Everything else is window-dressing. To understand the scale of the problem, and why it leaves so few options for policymakers, take a look at Chart 1. From the 1970s onward, the economy has undergone two profound structural shifts. First, the economy as a whole has become much more indebted. Output rose eight times between 1975 and 2007. But the total volume of debt rose a staggering 20 times, more than twice as fast. The total debt-to-GDP ratio surged from 155 percent to 355 percent. Second, almost all this extra debt has come from the private sector [as the following chart shows]. Despite acres of newsprint devoted to the federal budget deficit over the last thirty years, public debt at all levels has risen only 11.5 times since 1975. This is slightly faster than the eight-fold increase in nominal GDP over the same period, but government debt has still only risen from 37 percent of GDP to 52 percent. 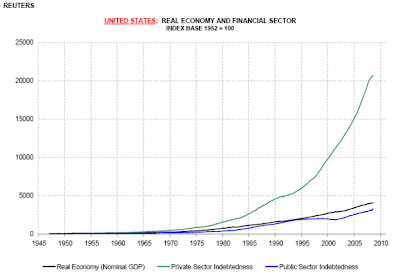 Instead, the real debt explosion has come from the private sector. 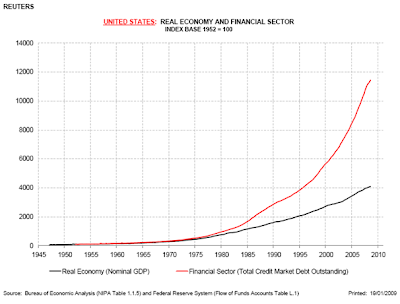 Private debt outstanding has risen an enormous 22 times, three times faster than the economy as a whole, and fast enough to take the ratio of private debt to GDP from 117 percent to 303 percent in a little over thirty years. The charts strongly suggest the necessary condition for resolving the debt crisis is a reduction in the outstanding volume of debt, an increase in nominal GDP, or some combination of the two, to reduce the debt-to-GDP ratio to a more sustainable level. From this perspective, it is clear many of the existing policies being pursued in the United States and the United Kingdom will not resolve the crisis because they do not lower the debt ratio. Kemp's article is an excellent read that inquiring minds will want to explore further. The key point is the path that Central banks are taking cannot possibly work. Buying distressed debt or playing shell games with good and bad banks will not resolve the basic problem which is too much private sector debt that cannot possibly be paid back. Clearly GDP needs to rise or debt levels reduced to reach a sustainable path. Kemp argues "widespread bankruptcies are probably socially and politically unacceptable." While I agree with that statement in theory, practice is another matter. I do not believe government has a realistic choice in an environment of global wage arbitrage, changing consumer attitudes towards debt, and demographics of boomer retirement. Attempts to inflate out of this mess, cannot possibly work for three reasons. 1) The burden of consumer debt will only decrease under inflation if employment recovers, wages rapidly rise, and outsourcing of jobs to India and China stops. The odds of that happening are extremely slim. 2) Government cannot really "create" any jobs per se. It can raise taxes and shift private sector jobs creation to government jobs creation (typically a malinvestment), and it can bring production and consumption forward for those jobs that are genuinely needed (filling potholes), but once the potholes are filled, one has to ask the question, "What will we do for an encore?" 3) Even if by some miracle the economy rapidly picks up, interest rates will rise. Homeowners who now are seeing rates fall, will once again be put in jeopardy by rising rates. Furthermore, interest on the national debt will soar. The National Debt is $10.7 Trillion as of January 7, 2009. As interest on the national debt rises, so will taxes have to rise to cover it. In Fiscal Year 2008, the U. S. Government spent $412 Billion of your money on interest payments to the holders of the National Debt. In short, there is no free lunch of inflating consumer debt away. Attempts to do so will only create bigger problems elsewhere. Expect to see a long-term period of extremely slow growth with the economy slipping into and out of deflation and recessions for years, to come. This is the path of Japan, not the path of the Weimar Republic.